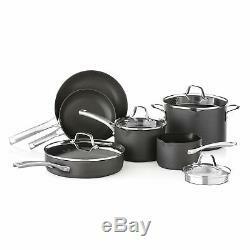 Calphalon 10-Piece Cookware Set Classic Nonstick Durable Oven-Safe Pots Pans. Each pot and pan in the Calphalon Classic Nonstick 10-Piece Cookware Set deliver fast, even heating plus effortless food release and quick cleanup to make superb cooking vessels in any kitchen. Hard anodized aluminum construction ensures thermal efficiency and durability. 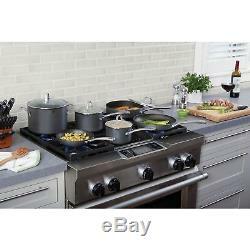 Dual-layer nonstick interior cooking surface for easy food release and quick cleanup. Suitable for use on most stove types, except induction. Oven safe up to 450º F. Tempered glass covers with oversized stainless steel handle allow you to visibly monitor cooking progress without letting and moisture from escaping. Fry pans feature gently sloped sides and flared edges. Sauce and stock pots come with pour spouts for easy, mess-free pouring and lids with an integrated strainer. Pots feature interior measure markings. 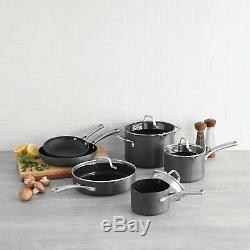 Extensive cookware assortment is perfect for making a wide array of dishes. Aluminum, stainless steel and tempered glass. 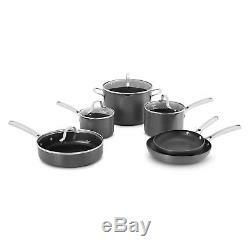 The item "Calphalon 10-Piece Cookware Set Classic Nonstick Durable Oven-Safe Pots Pans" is in sale since Wednesday, December 5, 2018. This item is in the category "Home & Garden\Kitchen, Dining & Bar\Cookware". The seller is "todaysfreshsells" and is located in 43229. This item can be shipped to United States, Canada, United Kingdom, Denmark, Romania, Slovakia, Bulgaria, Czech republic, Finland, Hungary, Latvia, Lithuania, Malta, Estonia, Australia, Greece, Portugal, Cyprus, Slovenia, Japan, China, Sweden, South Korea, Indonesia, Taiwan, South africa, Thailand, Belgium, France, Hong Kong, Ireland, Netherlands, Poland, Spain, Italy, Germany, Austria, Bahamas, Israel, Mexico, New Zealand, Philippines, Singapore, Switzerland, Norway, Saudi arabia, Ukraine, United arab emirates, Qatar, Kuwait, Bahrain, Croatia, Malaysia, Brazil, Chile, Colombia, Costa rica, Panama, Trinidad and tobago, Guatemala, Honduras, Jamaica, Antigua and barbuda, Aruba, Belize, Dominica, Grenada, Saint kitts and nevis, Saint lucia, Turks and caicos islands, Barbados, Bangladesh, Bermuda, Brunei darussalam, Bolivia, Ecuador, Egypt, Gibraltar, Guadeloupe, Iceland, Jordan, Cambodia, Cayman islands, Sri lanka, Luxembourg, Monaco, Martinique, Maldives, Nicaragua, Oman, Pakistan, Paraguay, Viet nam, Uruguay, Dominican republic, El salvador.